THE "Mechanics" IN MODERN "BIOMECHANIC"
LAST month's article presented the' principles relating to the "bio" of the athlete. The external environmental forces ("mechanics") could be the surface on which the athlete performs or the equipment that he holds. Other considerations might be the air resistance or the friltional forces of the surface. The interaction between the "bio" and the "mechanics" enables the coach to optimize the athlete's performance. Unlike the "bio", which is affected by structure, anatomy, physiology, genetics, and nutrition, the "mechanics" is governed by the physical laws, or universal tenets. Mechanical science originated with the ancient Greek scholars. One of the earliest phenomenons that aroused their curiosity was motion. The interaction between a human being and his environment is possible only through motion. However, motion does not require life, as a tennis ball can be hit or a dart thrown. The first Greek to put the principle into sophisticated form was Aristotle. He maintained that each element on earth had its own characteristics and, therefore behaved uniquely. The Aristotelian view of motion was accepted for a long time, but was later proved wrong. First of all, it did not deal with gravity. According to Aristotle, if a tennis ball were thrown into the air, the air itself would make the ball move. Without air, there would be no movement. Also, according to Aristotle, different masses had different gravitational forces. This theory also failed to prove out. The Italian scientist, Galileo Galilei (1564-1642), formulated the bases of freefalling bodies. By rolling different masses of balls across an inclined board, he found that the different weights rolled down the inclined plane at the same rate. If the plane were tipped more sharply, the balls would roll more rapidly, but all at the same rate of speed. In the end, all would cover the same distance in the same time. This means that freely falling bodies fall through equal distances in equal times, regardless of their weight. In short, a heavy body will not fall more rapidly than a light one. The importance of the falling-masses experiment lies in an understanding of acceleration. As was discovered by Galileo, the distance traversed by a body rolling down an inclined plane grows greater and greater in successive equal time intervals. This means that the rate of speed is changing, and this is precisely, what acceleration is-the change in rate of speed or, more accurately, velocity. The acceleration of free-fall bodies is a constant 32 feet per second. It was absolutely necessary for Sir Isaac Newton to understand acceleration in formulating the laws of motion. According to Newtonian law, the acceleration produced by a particular force acting on a body is directly proportional to the magnitude of the force and inversely proportional to the mass of the body. It is impossible to begin movement without applying force, whether it is an external force such as gravity, or an internal force such as muscular force. For example, the force applied to a hockey puck will create an acceleration that will set the puck moving faster and faster, as long as the force is applied. The length of time that the force is applied on the puck is important. In mechanics, the product of force and time is called an impulse. For a given mass, a given impulse will produce a particular velocity. The heavier the object, the greater the impulse needed to achieve the same velocity. It is obvious, that velocity and mass are related to each other; in fact, the product of mass and velocity is referred to as momentum. The law of momentum is most important in contact sports, where different masses collide at different velocities. For instance, it is this law that allows a smaller football player with greater velocity to block a heavier football player with less velocity. In the case of the hockey puck, the puck that possesses a certain mass and is speeding across the ice at a given velocity has momentum equal to its mass times its velocity. If, along its travels, it collides with another hockey puck of the same mass moving at the same speed but in the opposite direction, they will come to an instant stop. In other words, one momentum would cancel out the other. This principle of conservation of momentum is more visible in the game of billiards, where solid balls hit others at different velocities. The mechanicallaws and principles uponwhich optimalperformanceis based. movements where objects displace all their dimensions at the same rate. In the human body, however, every part is moving in rotational fashion. Take the wheel. The center remains stationary while every other part moves. Rotational movement requires an understanding of torque, or movement-a force that gives rise to rotational movement. The amount of torque depends on the force and the distance from the center of the rotational object. The product of force and distance is equal to torque. The conservation of angular momentum is one of the most important principles in athletic performance. Angular momentum can be expressed in terms of two other important parameters of rotation - angular velocity and moment of inertia. Angular velocity is represented by the body's rotational speed and direction. For example, if a diver performs a forward double somersault in one second, the magnitude of his average angular velocity is two revolutions per second. The moment of inertia of a body about an axis is the body's tendency to resist changes in angular velocity about that axis. It is obvious that massive and extended bodies have a larger moment of inertia than do lighter and smaller ones. In addition to these principles, the modern coach should be familiar with the forces of friction, the different principles related to levers in the body, and the principles governing potential and kinetic energy. 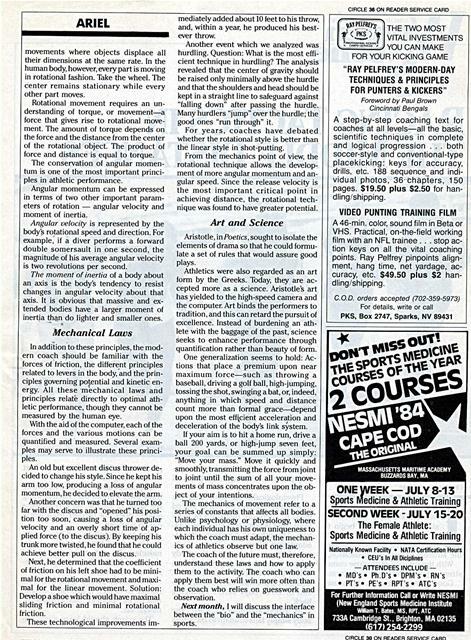 All these mechanical laws and principles relate directly to optimal athletic performance, though they cannot be measured by the human eye. With the aid of the computer, each of the forces and the various motions can be quantified and measured. Several examples may serve to illustrate these principles. An old but excellent discus thrower decided to change his style. Since he kept his arm too low, producing a loss of angular momentum, he decided to elevate the arm. Another concern was that he turned too far with the discus and "opened" his position too soon, causing a loss of angular velocity and an overly short time of applied force (to the discus). By keeping his trunk more twisted, he found that he could achieve better pull on the discus. Next, he determined that the coefficient of friction on his left shoe had to be minimal for the rotational movement and maximal for the linear movement. Solution: Develop a shoe which would have maximal sliding friction and minimal rotational friction. mediately added about 10 feet to his throw, and, within a year, he produced his bestever throw. Another event which we analyzed was hurdling. Question: What is the most efficient technique in hurdling? The analysis revealed that the center of gravity should be raised only minimally above the hurdle and that the shoulders and head should be kept in a straight line to safeguard against "falling down" after passing the hurdle. Many hurdlers "jump" over the hurdle; the good ones "run through" it. For years, coaches have debated whether the rotational style is better than the linear style in shot-putting. From the mechanics point of view, the rotational technique allows the development of more angular momentum and angular speed. Since the release velocity is the most important critical point in achieving distance, the rotational technique was found to have greater potential. Aristotle, in Poetics, sought to isolate the elements of drama so that he could formulate a set of rules that would assure good plays. Athletics were also regarded as an art form by the Greeks. Today, they are accepted more as a science. Aristotle's art has yielded to the high-speed camera and the computer. Art binds the performers to tradition, and this can retard the pursuit of excellence. Instead of burdening an athlete with the baggage of the past, science seeks to enhance performance through quantification rather than beauty of form. One generalization seems to hold: Actions that place a premium upon near maximum force-such as throwing a baseball, driving a golf ball, high-jumping, tossing the shot, swinging a bat, or, indeed, anything in which speed and distance count more than formal grace-depend upon the most efficient acceleration and deceleration of the body's link system. If your aim is to hit a home run, drive a ball 200 yards, or high-jump seven feet, your goal can be summed up simply: "Move your mass." Move it quickly and smoothly, transmitting the force from joint to joint until the sum of all your movements of mass concentrates upon the object of your intentions. The mechanics of movement refer to a series of constants that affects all bodies. 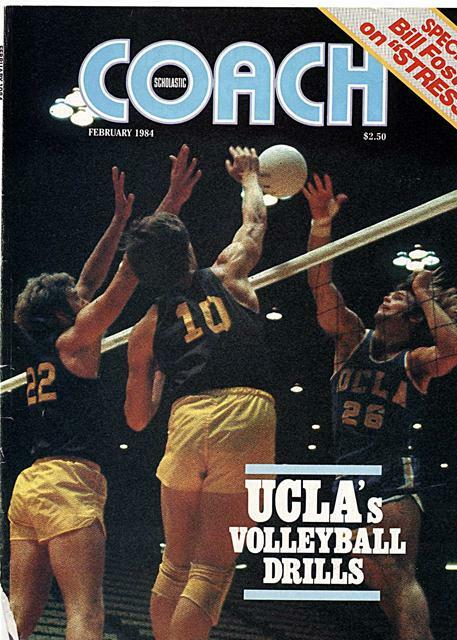 Unlike psychology or physiology, where each individual has his own uniqueness to which the coach must adapt, the mechanics of athletics observe but one law. The coach of the future must, therefore, understand these laws and how to apply them to the activity. The coach who can apply them best will win more often than the coach who relies on guesswork and observation. 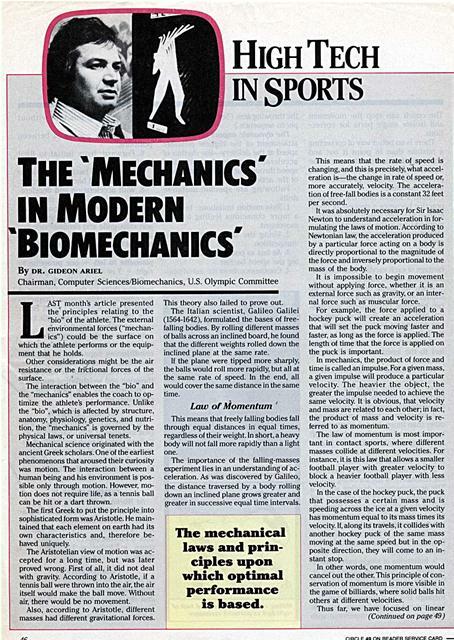 Next month, I will discuss the interface between the "bio" and the "mechanics" in sports. "RAY PELFREY'S MODERN-DAY TECHNIQUES & PRINCIPLES FOR PUNTERS & KICKERS"
A step-by-step coaching text for coaches at all levels-all the basic, scientific techniques in complete and logical progression ... both soccer-style and conventional-type placekicking: keys for accuracy, drills, etc. 188 sequence and individual photos, 36 chapters, 150 pages. $19.50 plus $2.50 for handling/shipping. A 46-min. color, sound film in Beta or VHS. Practical, on-the-field working film with an NFL trainee ... stop action keys on all the vital coaching points. Ray Pelfrey pinpoints alignment, hang time, net yardage, accuracy, etc. $49.50 plus $2 handling'shipping. Generated on 4/25/2019 11:17:02 AM (PST) ADI/HQ/GBA/2019/ARIELCLOUD/v3.0.2018.0126.